Kettle Chips certainly keep it simple. And so shall we. Color coded bags. Colors associated with the flavor. Minimalist design. Plain but fairly perfect. If Kettle want to put a 'Q' in Barbecue, and a 'Bleu' in Cheese, they could have provided a 'Classique' twist for Classic. The brown wavy Chips in the background are not needed as the bold color flavor coding works brilliantly to make the bag stand out. Kettle never short-change you on a Crunch test. These Chips were no different. The Waves provided additional crash, the Kettle Cooking provided additional bang and a mouthful provided a crunchy munchy wallop. A near perfect crunch. There were a lot of smallish sized Chips. There were some curly ones as well, which you don't always find in Ridged Chips bags. There was some skin and brown blemishes. The Ripples were wide but not deep and mostly had a crusty appearance, splattered with seasoning here and there. 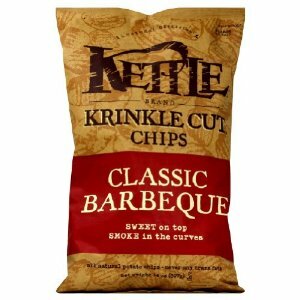 With so many variations on a theme, Kettle Brand have us a little Barbecued out! To us, this tasted no different to the organic version. 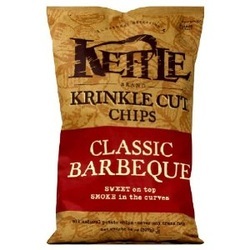 They were a good example of a Barbecue flavored Chip upon which you go up and down the sliding scale, using this as the central judgement point. Although average, that is a good thing - these were very pleasing.